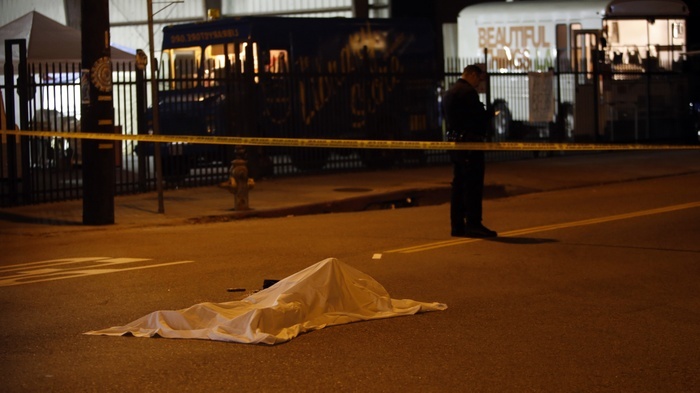 How common are fatal shootings by police in downtown L.A.? Posted March 6, 2015, 5 a.m.
Posted Jan. 20, 2015, 11:41 a.m. The recent shooting of a homeless man — who was identified Thursday as Charly Leundeu Keunang, 43, after days of international mystery — has once again drawn focus to police use of force. Los Angeles Police Department officers so far this year have fatally shot three people, two downtown. In addition to Keunang, 24-year-old Pablo Meza was shot and killed Jan. 17 near the intersection of Jesse and Mateo streets. Officers responded to a call of a man with a weapon. Police said he was waving a gun in the air and acting erratically. Meza died blocks away from skid row, which is defined as the area bordered by East 3rd, Alameda, East 7th and South Main streets. 2:10 p.m., March 6: An earlier version of this article misspelled the first name of the homeless man killed by the LAPD as Charley Leundeu Keunang. The man's name is spelled Charly. The trendy parts of downtown Los Angeles, along with the areas dominated by business and government agencies, are generally safe. But officer-involved slayings are more common downtown than in Watts, where the homicide rate is higher. To arrive at the numbers that follow, the Homicide Report looked at the percentage of homicides involving law enforcement in city and county neighborhoods, as well as the number of officer-involved homicides compared with killings that didn’t involve law enforcement. Downtown has a population of more than 42,000, according to Census data. Compared with neighborhoods of similar size — Watts and Bell Gardens have populations within 3,000 of downtown's — downtown has the highest rate of officer-involved incidents, with 3 per every 10,000 residents since 2000. That’s based on 13 officer-involved killings in downtown’s boundaries since 2000. Bell Gardens has seen two in that time. Watts, a community that is more notorious for violence, has 1.4 officer-involved shootings per 10,000 residents. Since 2000, there have been six officer-involved killings in the area; the last person killed was Arturo Cabrales, 22, who ran away from law enforcement after a traffic stop three years ago this week. A gun was recovered after the shooting. Family members dispute the LAPD narrative. But including non-officer-involved killings, Watts is the deadliest neighborhood — compared with downtown, Bell Gardens and communities of similar size — with 67 killings per 10,000 people. Downtown isn’t far behind, with 52 per 10,000. In instances involving officers who fire their weapons intentionally, the deadliest neighborhood doesn’t always translate to a higher rate of officer-involved homicides, said Dave Klinger, a criminologist from the University of Missouri at St. Louis. Klinger conducted a recent study about use of force and levels of violence and found that the deadliest neighborhoods often had a lower rate of officers purposely opening fire than neighborhoods in the mid-range for violence. And the same goes for a person who may be involved in a potentially deadly encounter, a person Klinger calls a “savvy suspect.” People in higher-crime neighborhoods are more aware of the police and how to interact with officers. Update, March 14: The Times has updated some of the numbers reported in this article. Read more here. Charly did not have a gun and still got killed by a scared officer that couldn't control himself in the situation, even when he had multiple other officers there to back him up. What is the excuse for his idiotic behavior? Oh right, he got scared. When people get scared they think irrationally and do dumb things. We cannot afford to have a bunch of scared police officers out there killing people every time they get scared. Take away their guns and give them to seasoned officers who have more tactical acumen. — Somebody April 18, 2015 at 10:12 a.m.
— nobody March 11, 2015 at 1:49 a.m. I'm no master on this subject, but it seems that every time their is a police shooting. The police always say "they were afraid for their life or other officers lives". So they shot to prevent the person from getting a gun and shooting them. Isn't this the majority of the shootings/killings. My question is, and I'm sorry if this sounds dumb, but can't the police come up with some type of better bullet proof type gear that would protect them even if they were shot. Therefore taking away the fear. I mean, if they had the mentality of "I don't care if the guy shoots at me, it'll never penetrate or hurt me", then the police could take a few more seconds to taze someone several times or whatever to get the situation under control, rather than, "I was scared I would die" so I shot him in the chest 3 times. I guess some things in theory sound better than the real world schematics of things. I just wish this was the way. For example, if an officer knew they might get into a confrontation, they could put on their 'gear' and not be afraid of a perpetrator having a gun. Therefore not have to shoot first and ask questions later. Of course there would always be surprise confrontational situations where an officer would not have time for 'gear' or anything and might be completely justified in a quick shooting. — Mystery Writer March 9, 2015 at 9:47 p.m.
Skid row has a large number of people with mental illnesses. They don't necessarily react the same way to police as others. This may account for the relatively high rate of officer-involved killings. — rtamtc March 6, 2015 at 12:37 p.m.
What do you expect when you have to deal with hundreds of crazy people who are either drunk or on drugs? Of course the police have to use deadly force more frequently. — syscom3 March 6, 2015 at 10:28 a.m.
— Andrew Kane March 6, 2015 at 8:57 a.m. This article is not accurate because it intentionally skews numbers to get a desired result. The population numbers are very misleading, since it does not account for thousands of homeless and several hundred thousand additional people who work, but don't reside in downtown. Just for one sporting event you will draw over 30,000 people. If you were to redo the calculations with the average number of people who are in the area any given time the numbers would be statistically insignificant. You would need to multiple the number of people in Watts times 10 to get a true account. This article only focuses on people who die as a result of an officer-involved-shooting, not the total number of incidents where an officer shot at someone. — CB March 6, 2015 at 8:01 a.m.